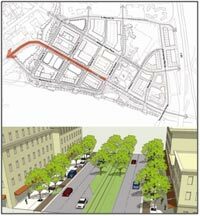 from an urban freeway to an urban boulevard may eliminate a number of these safety concerns and improve the integration of the road with the surrounding urban environment by lowering the speed limit, installing traffic signals, providing pedestrian crosswalks, connecting side streets and enhancing access to the waterfront. A feasibility study of the southern section of Route 29 Boulevard between the Richey Place/Calhoun Street interchange and the Cass Street intersection was initiated by the New Jersey Department of Transportation (NJDOT) in 2007 as part of a shared vision among state and local entities to revitalize downtown Trenton and reconnect the city to its waterfront. The feasibility assessment report, completed in February 2009 evaluated the potential replacement of the existing freeway with an urban boulevard that would easily blend in with the city's surrounding context. Maximizing safe physical and visual connections between the community and the Delaware Riverfront. Strengthening established neighborhoods and the capital district. Facilitating redevelopment of underutilized land within the capital district. Creating a context sensitive network of streets and open spaces. Providing safe and convenient modal choices to encourage the use of transit, cycling and walking. Accommodating motorists in a safe manner at reduced speeds. engineering/design improvement details for the preferred alternative are described in the study document. A joint coordination committee co-led by the City of Trenton and the CCRC will be formed to move the project forward from the study phase to reality. Preferred alternative concept for Route 29 Boulevard, north of Market Street - landscaped median is sized to provide space for future light rail transit line.